featuring Ruby Amanfu, Peter Cooper, Bob DiPiero & Dennis Matkosky. 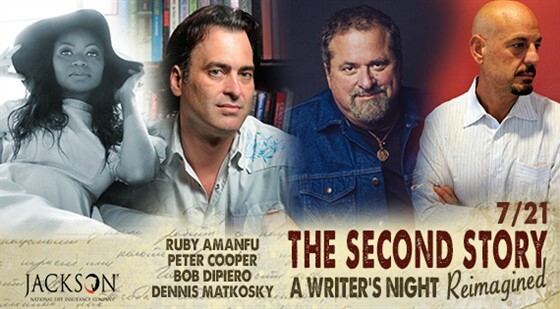 A Writers Night “Reimagined” featuring Ruby Amanfu, Peter Cooper, Bob DiPiero & Dennis Matkosky. The Second Story is not a musical group or the name of a new band, but the title of a special evening of songwriter performances and their words and music paired and reimagined in a unique way through the words of an author, poet or playwright. Like many songwriter presentations, our “first story” will be the traditional round of performances and stories behind the songs. Our “second story” is a new concept that will interlace the talents of those songwriters with someone from a seemingly totally different realm of creativity. Ruby Amanfu has built a rich and varied career based on an array of exceptional talents and a singular voice. Whether lending vocals to Beyoncé’s album, Lemonade, or writing and performing Grammy-nominated songs, the Ghana-born, Nashville-reared artist has generated a succession of critically acclaimed projects. Her single “Sugah" reached No. 3 on Billboard’s airplay chart in 2003. Songs she has penned have been cut by a variety of acts, including Kelly Clarkson, Lene Nystrom, Sanne Salomonsen, Rachael Lampa, and the Duhks (for which she received Grammy recognition). She has performed on stages ranging from the Grammys, to two appearances on Saturday Night Live, as well as Fuji Rock Festival in Tokyo, Japan, to name a few. Ms. Amanfu's is also a part-time actor (currently appearing as herself on the current season of "Nashville"), chef and blogger. Since his first #1 in 1983, Hall of Fame Songwriter Bob DiPiero has been responsible for an uninterrupted string of country music hits. One of Nashville’s most prolific and consistent songwriters, he possesses a humble drive and over 1,000 songs recorded by other artists, countless hit singles, and an astounding 15 #1 hits. His songs have been featured in TV shows, commercials and movies and, in 2011, his song “Coming Home” from the Country Strong movie soundtrack was nominated for both an Oscar and Golden Globe Award. Among his countless awards are 50 BMI Million-Air honors and multiple Songwriter of the Year awards. Bob also originated the CMA Songwriters Series and has served as its host for 10 years, bringing Nashville’s finest writers and artists throughout the United States and overseas to Belfast, Dublin, London and Paris. Dennis Matkoskyis the Grammy award-winning, Academy and Golden Globe nominated versatile virtuoso responsible for such iconic radio smashes as “Maniac” (#1 in 18 countries), “I Need You” (LeAnn Rimes) and “You'll Think Of Me”, the pop-crossover #1 smash by Keith Urban. From “Flashdance” to Rascal Flatts, the day in the life of this classically-trained guy from Philly can take quite a leap. He has also penned hits for Diana Ross, Boz Scaggs, Smokey Robinson and Kenny G (to name a few) and somehow manages to juggle writing appointments from Nashville to LA to London and back, while also nurturing and developing the careers of artists and songwriters such as Bailey Bryan and Michael Hardy. With a lineup like this…come prepared for one of the most memorable evenings of the year!